Starbucks is far from a foreign concept in France these days. They exist but mainly in big cities like Paris and aren’t all over the place like you’d find in the USA. 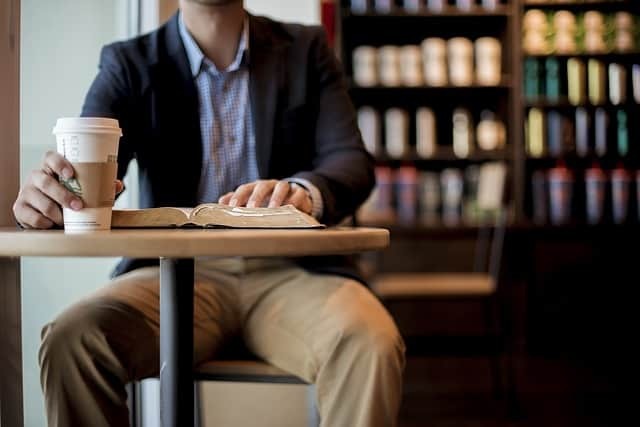 I’m the first to admit that regular old Starbucks coffee tastes burnt — I’m more of a Dunkin’ Donuts gal — but what about the convenience of chai and other specialty beverages, free Wi-Fi and comfy chairs? Well, let’s just say I took the convenience factor for granted back home. Luckily though, a couple of Starbucks shops opened up last year in Nantes, the closest big city to me. 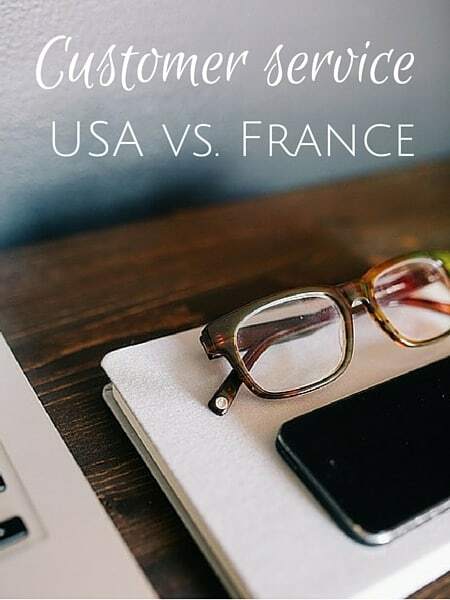 Starbucks locations are pretty similar when it comes to branding no matter where you are, but there are some marked differences between Starbucks in France versus the USA. 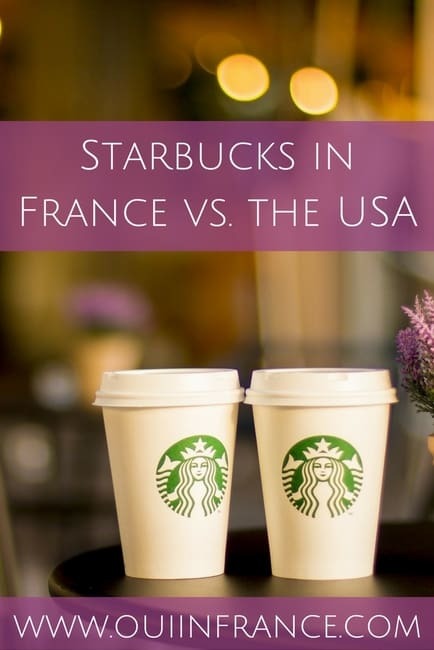 If you want a familiar drink to-go and feel like popping into Starbucks, here’s how your beloved American chain might differ in France. 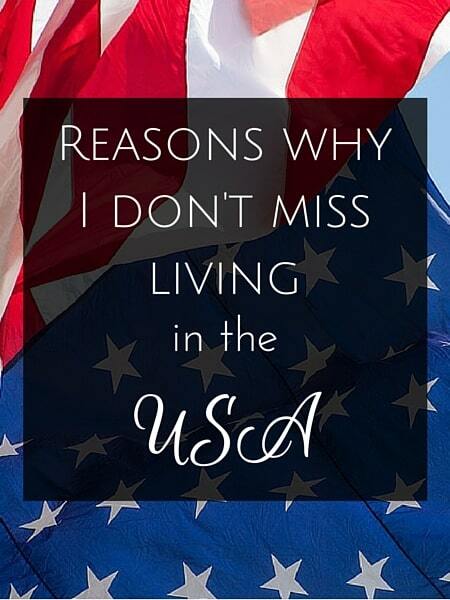 During college while living in NYC, I’d have to be at work at 5:30 a.m. The Starbucks on the corner that opened at 5 a.m. was a godsend and I’d swing by for my morning jolt on the regular. But in Paris? Well, I guess those who start work early aren’t grabbing a cup of caffeine to kick off their day. And that would make sense because most Starbucks in France don’t even open until 7:30. Forget about a 6 a.m. coffee run because the employees probably aren’t even out of bed yet. 7:30 a.m. feels really late to me for an opening time. The to-go coffee culture isn’t mainstream in France, and even in big cities, you can see how the hours of operation differ. Starbucks isn’t known for being affordable. Luckily for us, the euro/USD exchange rate is in American tourists’ favor so they won’t be too shocked at the register. 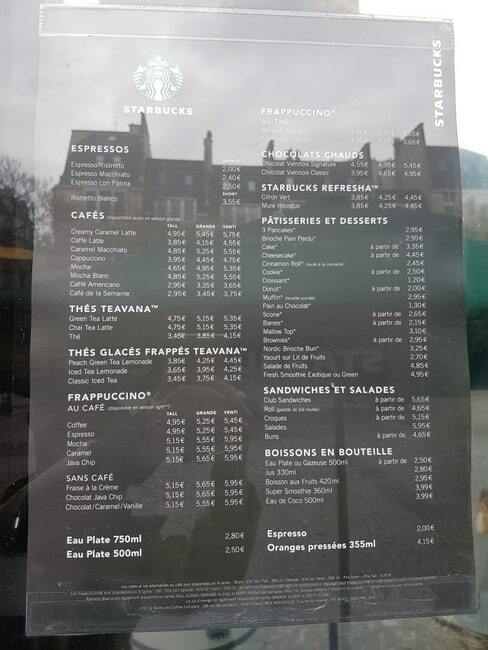 But still, zoom in on the above Paris Starbucks prices and prepare to choke on your skinny latte. Take, for example, a tall caramel Frappuccino. It’s 5.15 €! Before you know it, an extra shot, some syrup, and specialty milk can easily cost a substantial chunk of change. The only time Starbucks hurt my wallet worse than in France was in London. I won’t even go there. Starbucks in France is for people looking for something else besides what traditional cafe culture can offer. If you want the French cafe experience, don’t go to Starbucks. The chain is known for its big plush chairs, free Wi-Fi, specialty drinks, and soothing music where you can happily work on your laptop without being bothered. When the French grab a coffee with friends, they generally sit to sip, so Starbucks shops in France tend to have a good amount of seating, often outdoors and upstairs as well. Just kidding. Starbucks in France doesn’t sell alcoholic beverages. Go to Burger King for that. Have you been to Starbucks in France? Are you more of a to-go type or do you like to sit down and sip your drink sur place? I’m a big fan of options. 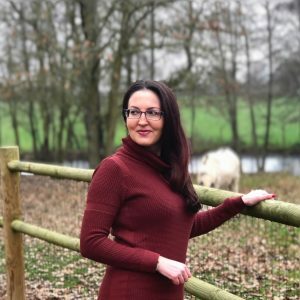 I’ve been to Starbucks in Brussels and Marseilles (both very different from the U.S.–tiny, a few tables and hard chairs, no place to linger). In Carcassonne, a Columbus Coffee just opened in a supermarket gallery. It is always busy, even though a big café crème at one of the other cafés costs far less. We go for the frappucinos. I do see takeout in Carcassonne: china cups of steaming coffee on a tray, hustled from a café to an office or shop nearby. I hope that never goes away. There’s a Columbus Coffee in Angers and while the drinks were pretty good and the decor is nice, I wasn’t impressed with the service. There is one register and one barista so if you’re 10th in line, you’re going to be waiting awhile while the one barista makes a specialty drink with about 4 steps per drink. Took forever! What do you think of CC? 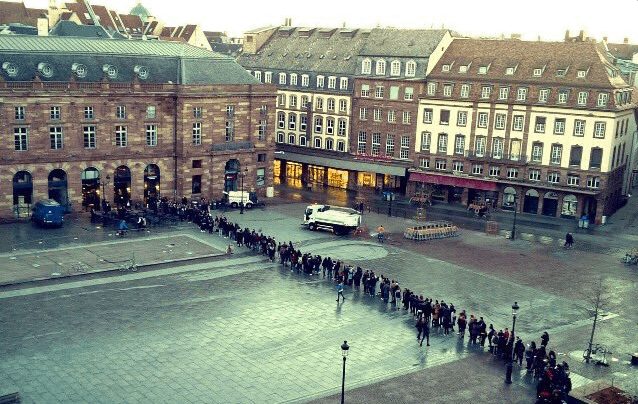 OMG that queue in Strasbourg is insane….seriously? Can’t believe anyone would queue that long for a Starbucks. I have never come across one in France as I stay in rural areas but wouldn’t use them anyway. Why visit France and go to Starbucks? (Appreciate it’s different for those living there.) Would much prefer to go to a typical French café for my crème, where it would be cheaper too. If I needed free wifi I’d head for McDo’s. I haven’t actually been to a Starbucks in France, but I tried once. My train was coming in late and I wanted a coffee in Paris before my train home . . . and was shocked to discover that it was closed so early (by American standards anyway)! I did go to Starbucks when I was in Geneva and I about died at the prices – it was over $10 for a grande iced gingerbread latte! Oh man, Geneva tops London for sticker shock! I used to love sitting in the big, plush chairs, but now all of the Starbucks that I’ve gone to in the last few years have hard chairs. They’ve removed the plush and leather chairs that were so comfortable. Probably because some people would just stay all day. I think they also make the music here annoying so people won’t stay too long. It’s almost always too loud, sometimes good music and sometimes awful noise that I can’t wait to get away from. Their prices are too high. It’s ridiculous! But, I still stop in too often. My favorite drink only costs $3.85, but it used to only be $3.27 – even at just that small amount each day, I gave them $1,000 a year x 7 years! $7,000 for warm, spiced milk, basically! I know! When you do the math, it really makes you question whether it’s worth it. Like you, I used to stop in too often (especially when at work in NYC, there was one in my building’s lobby). Now it’s a real treat so I make sure I thoroughly enjoy it! I want to try one of those matcha green tea lattes. I’m intrigued. I think the frozen matcha green tea latte is pretty good, but I didn’t like it hot. And, they always come up with new names and drinks that sound intriguing so people try them and get hooked, like smoked butterscotch, and now there’s a cascada latte, whatever that is, and some new iced caramel drink. I took my kids to Paris in January and our hotel was right next door to a Starbucks. For familiarity, we went in several different times. Could never find a place inside to sit! People were sittOmg and sipping and others looked like they were in meetings. Was exactly like my local U.S. Starbucks! Went to one in London, all hard seating and barely people around hanging out. I guess London is all about the to-go culture. When back in NYC, I’d say I got my drink to go 90% of the time. 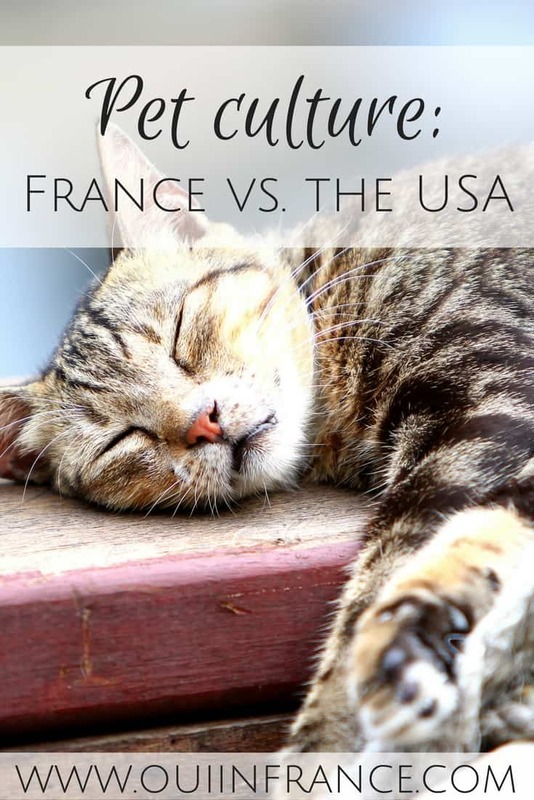 In France, totally different ballgame. Hope you had a great trip!